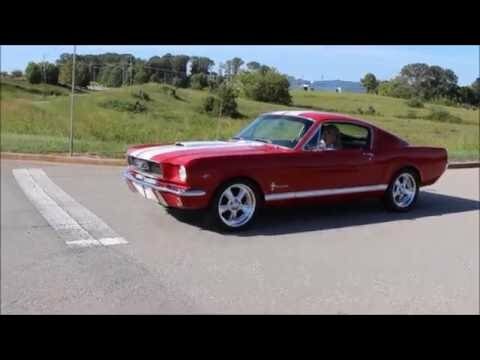 Up for sale we have a 1966 Ford Mustang Fastback. The body has great lines and looking down the sides the panels are straight. Everything is covered in the slick Red paint that has a deep rich shine and is accented by the White Stripes. At the time of the repaint new seals were installed around the windshield and back glass. The bumpers were replaced as well as other chrome like the door handles and tail light trim. To complete the look it's sitting on a set of 17” Billet Specialty Wheels. On the inside it's all done in Black with the correct bucket seats and console. It being a 2+2 it does have the fold down back seat. The seat covers, carpet, and door panels all look like new as does the headliner. When you look at the dash it's also black and looks all stock with a new dash pad. It has the AM FM Radio and the gauge instruments with the 140 Speedo. To complete the look it has the Ford wood wheel and a set of Ford floor mats. Finally, we will take a look at the driveline of the Ford. Under the hood it looks clean and is powered by the 289 V8 hooked to a C4 Trans and an 8” Rear End. Everything is detailed nicely with the motor being painted. It retains the stock manifolds and single exhaust. This Mustang comes with Power Steering as well. When you look under it the floors all appear solid.